This THP is about 11 miles NE of Shingletown, CA and Highway 44 at an elevation of 4,200 to 5,600 feet. 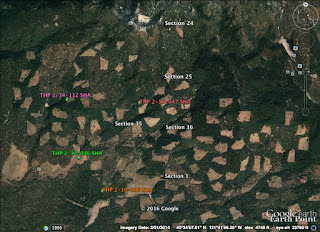 Sierra Pacific Industries is planning a clearcut tractor based logging operation in ponderosa pine, sugar pine, incense cedar, white fir and Douglas fir forests. The THP area drains into the Battle Creek watershed which is a Chinook salmon and steelhead watershed. SPI is planning to build short temporary spur roads under 500 feet long to connect units without pre-designating locations, and construct seasonal roads in sections 25 and 36 with steep road beds exceeding 15% grade for over 200 feet. They also are planning to construct a 65 by 50 foot waterhole within a class II (mid sized) watercourse. 18 road drainage sites are proposed for work Including rocking, dip construction, ditch cleaning and repair/replacement of culverts. Two fisher sightings were reported in 2011 in sections 35 and 36, and in 2012 a fisher sighting was reported in Latour State Park in section 22 which is 1.75 miles NW of the THP area. Two goshawk nest sightings were reported, one in 2000 in section 13 which is 1.75 miles north of the THP area, and one in 2002 in section 32 which is 2 miles east of the THP area. Upswept moonwort was found in sections 25 and 36, Rattlesnake fern was found in section 35, Butte county fritillary was found in section 35, Giant chekerbloom was found in section 36 and Obtuse starwort was found in section 24. 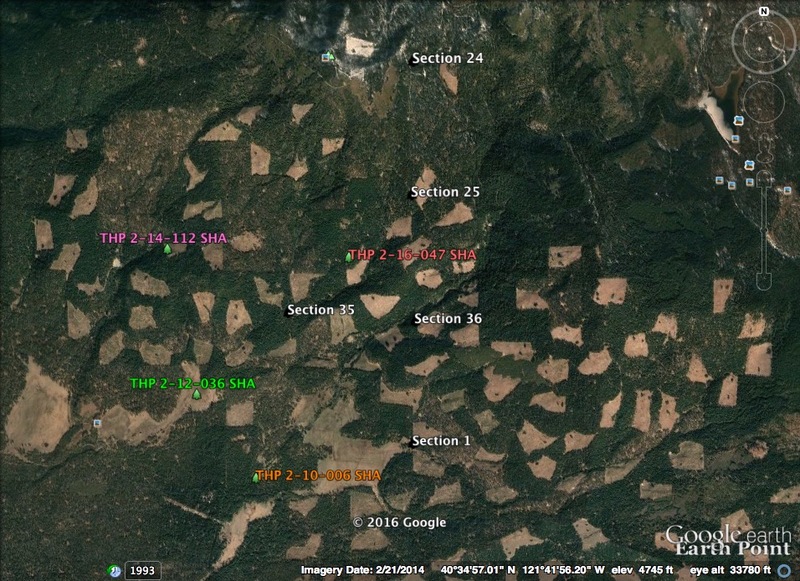 A CA spotted owl nesting territory is located in Section 30 which is .75 mi east of the THP area.